We recently had a magical year. From April 2013-June 2014 we had the opportunity to share a workspace, we had no money to pour into it so it remained a simple space and we wouldn't have it any other way. Friends pitched in, our husbands helped move and build tables, and we loved every moment of it. A working space is important to productivity. For us, our simple space was a home away from distraction, a place to clear our minds and dive into our art form. With Lily's move to the West Coast we both are working out of our homes again and rediscovering how to make a space that cultivates creativity amongst the laundry. Anyone else have experience with this? I spent some time mourning our old studio but then realized it was time to dig my feet in and create a new setup that fit my needs at this stage of life. I also had to allow myself the time to sort out how to organize my office/guest room... which I had great guilt about. Sometimes giving yourself the opportunity to straight things out results in more productive days because you feel like yourself again. Go on, give yourself the time! 1. Where is the natural light? For me, working where the natural light is strongest keeps me awake and alert. It also now means that I generally start my day at the kitchen table and then follow the sun to my desk for the afternoon. 2. Clutter, Simplicity or Organized Chaos? Do you work best when you have piles of stuff and inspiration around you or are you a white wall not outside source worker? Once you figure that out it tends to encourage focus thanks to your mind being at peace. I am very particular about my tools. When I have the right pencils, right notebook/sketchbook, eraser and mouse, everything seems to flow. I feel like myself and don't pay attention to the fact that my handwriting looks a mess thanks to running out of my favorite pens. 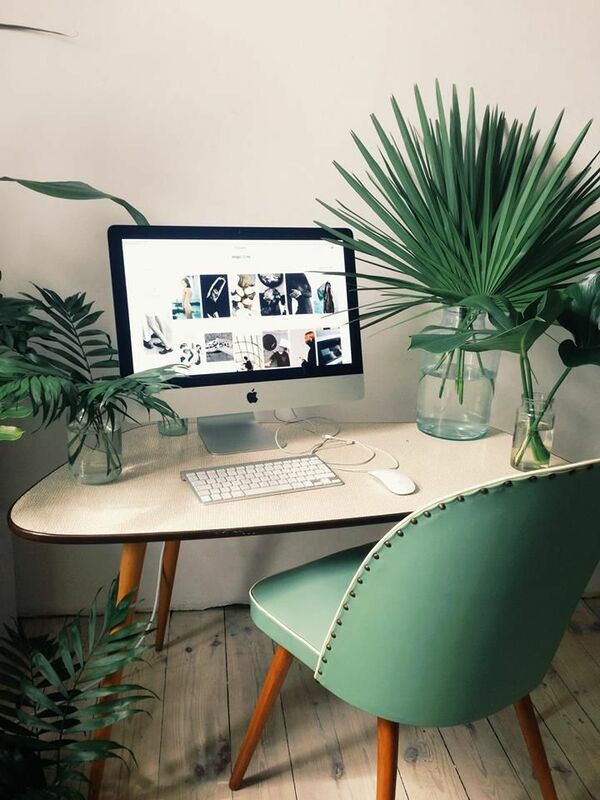 Our favorite things: flash drive / shelves / headphones / pencils / notepad (that doubles as a mouse pad) / plants, plants, plants! and don't feel guilty about it. When I worked in an office I removed myself from work for at least a half an hour to eat lunch. Would walk to get coffee or would even just have a dance party to get my blood flowing back to my head! Your work space is important but removing yourself from it is also important. Hopefully this post comes as a small encouragement to you to make your space a priority and to give yourself time to analyze how and where you work the best. If you need a little inspiration click here here and here!